2018 Wahine Regatta is a windy success story! Read more about it and see the pics by clicking here! 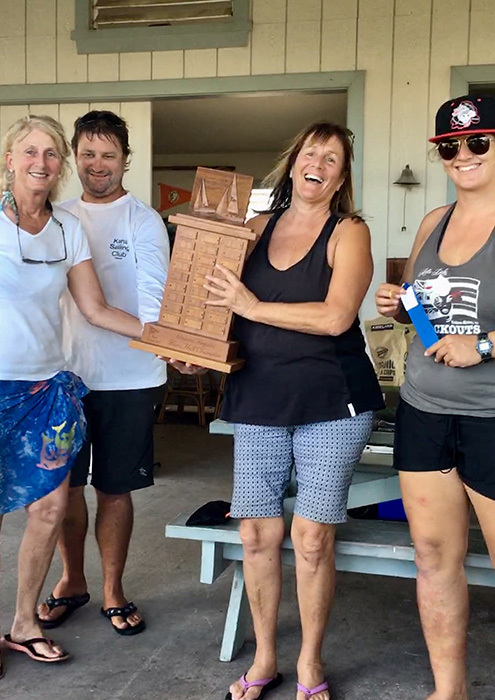 The Wahine Regatta started in the early days at the club as a “Jack & Jill” event, but over the years has morphed into a ladies only event that serves both the club members and the community at large. The goal of the Wahine Regatta weekend is to provide more education for female sailors, in a fun and friendly atmosphere – leading to more confident and competent female crew and skippers. The community outreach aspect creates an opportunity for the club to highlight the camaraderie and companionship that is a hallmark of Kona Sailing club, and helps to generate excitement and interest among prospective new members. Wahine Regatta begins with an on shore clinic, taught either by experienced club members or outside coaches; the first day ends with on the water practice designed to illustrate the whiteboard instruction. The second day consists of a short race, followed by awards and socializing at the club.